Everyday Adventures: ...And We're Back! First off: boards. I took it, I survived, I have no idea how it went, I don't have my score back, I'm still praying I passed. I am LOVING the brief time off from school/studying. I haven't been doing much at all, really... putzing around my apartment, cleaning and organizing, catching up on Modern Family and Up All Night, flying through the Hunger Games trilogy, reconnecting with a couple of people in Atlanta, getting some exercise, playing with my pup. And speaking of Izzy, it's high time for an update. Martin and Marielle kept her for a week while I went to Colorado for the exam, and I think it's pretty safe to say that she had more fun during that experience than they did. When I asked him how it went, Martin said, "I have no idea how you do it." It was so awesome of them to help out, even if their niece is a ball of spastic energy that demands constant attention. She adores Marielle, who has a higher chaos tolerance than my brother does. Jake and I went to Birmingham to pick her up and hung out there for a long weekend, and I found a really great dog park literally blocks from their house that Izzy loved. Izzy also has a playmate named Haley (my roommate's dog). Haley was initially not too sure about this obnoxious puppy invading her space all the time, but they seem to be getting along pretty well by now. Izzy doesn't ever not want to play, and Haley walks around with this resigned, exasperated expression on her face half the time, but they do plenty of wrestling and tug-of-war-ing and sometimes even snuggle together with me or my roommate on the couch. I tried to get a good picture of the two of them together, and this series is what I ended up with. 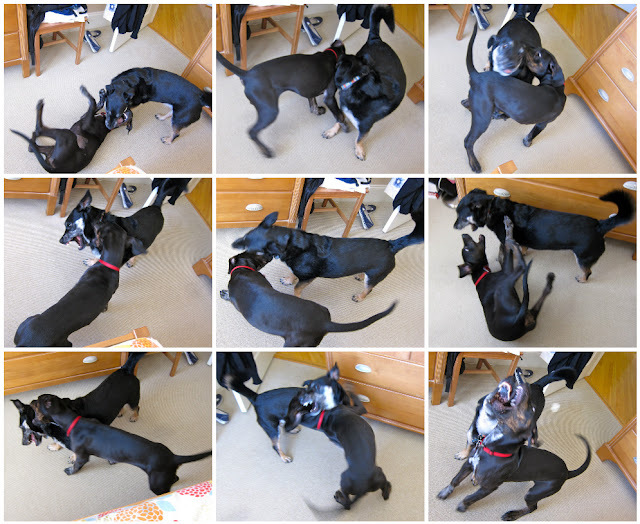 My compilation of Izzy and Haley playing together - the freeze frames of them with their mouths open and their teeth bared make them both look really scary, but they are not actually biting each other, just mostly slobbering all over each other and making a lot of growling noises. Haley always decides that she is done with this game sooner than Izzy, and it is the only time that Izzy ever barks - when she is trying to badger Haley into playing more. Not telling people that you're also going on a CRUISE to the BAHAMAS with your AWESOME SISTER??? Izzy is SO big and SO cute and I miss her!!! Oh, you too, sis.